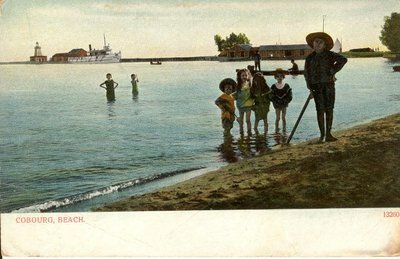 Coloured postcard of the beach and wharf at Cobourg, Ont. about 1904. Groups of small children face the camera from the beach and in the water. A small row boats just behind the children. A steamboat lies next to the wharf immediately inside the harbour lighthouse. Reverse: "Made in Germany. A. L. Merrill, Toronto"